So you’re married – congrats! 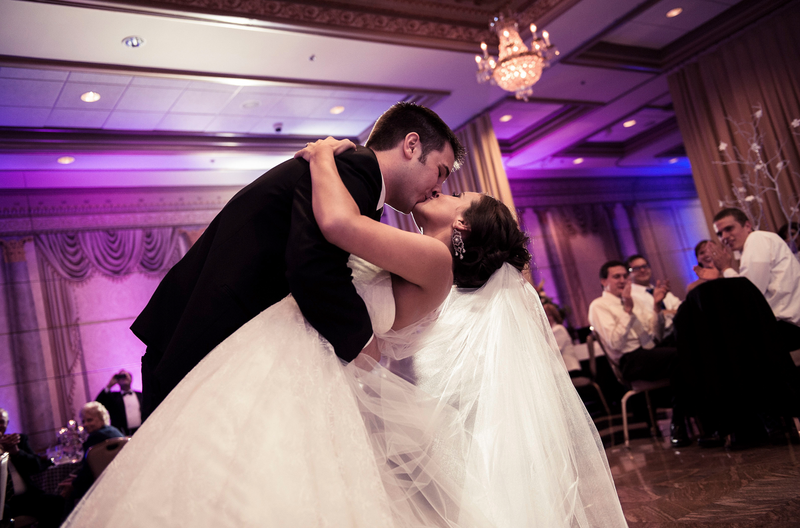 It’s time for the ceremonial “First Dance”, and unless you’re that couple who has their own “special song”, chances are that you’re at a loss when it comes to this music decision. What makes it harder is that neither you nor your fiancé are professional dancers (I’m guessing), yet now you need to get up and dance in front of your entire guest list. Well, we can’t give you dance lessons, but there are a couple things we know about picking music! Let me put you at ease and tell you that in my professional experience, just about every first dance I’ve ever seen at a wedding is sweet and simple. It doesn’t matter if you have two left feet, a tender slow dance is all anyone expects. If you’re losing sleep over memorizing choreography for your first dance, you should probably simplify and just enjoy the moment for what it is. Sway back and forth, maybe a dip at the end for effect, and you’ve just successfully executed a beautiful first dance! As with any of the music in this blog series, there is a wide range of options available for first dances. Do you choose Fast or Slow? Current or oldies? Jazz, Pop, Rock, Classical? Live or DJed? And how long should it be? Let’s start with length – which I always recommend at about 2 minutes. If there is no choreography planned and your plan is to sway back and forth, don’t sway for so long that your guests take out their phones and start checking emails. If you don’t dance professionally, 2 minutes of dancing with everyone watching can feel like 20 minutes to you. This is long enough to enjoy your moment, but short enough so that people don’t zone out. As for the other options about tempo and style, this is solely up to you and the vibe you’re going for. First dances are traditionally slow and tender, but there’s no rule about breaking out some JT or taking it back to your favorite 80’s tune. But again, I’ll assume we’re gong more towards the “norm” here. These are the tunes your grandparents likely grew up with. Think about the love tunes sung by Sinatra and Nat King Cole – these make for extremely tasteful first dance choices. Slow tunes such as “At Last” as sung by Etta James are standard go-to options, or if you’re looking for something with a bit more pizzazz (I’ve never actually used pizzazz in a sentence before! ), think about a medium swing tempo like L-O-V-E as sung by Nat King Cole. These are tunes that are expected, classic, and loved by all. And if you’re going this route, make sure to read the lyrics – today’s music just can’t compare! Or you have your slower top 40 choices, like Adele, Jack Johnson, or Train. These can be great choices as well – I have a number of them in the playlist below! However, make sure you listen to and understand the lyrics (but for a different reason then the jazz tunes). For example: James Blunt’s song “You’re Beautiful” was extremely popular…but the lyrics are about not having the girl who is so “beautiful”. The last thing you want is to find out after the wedding that your special song is actually a break up tune with a catchy title. Choosing a company like Felix and Fingers offers the option of either hearing a live version of your first dance, or having us DJ the real version. Both work equally well, but my general rule is this: DJ one, DJ all. A mix of live and DJed music lacks a certain cohesiveness in my opinion. Chances are that it doesn’t make a huge difference to your guests, but in my detail oriented approach, I’m always looking for the cleanest execution possible. Live does add a certain level of class to the presentation, but do keep in mind, no one is going to sing your favorite Dave Matthews song like Dave Matthews himself. To return to the wedding blog index, click here!